I love everything beauty related, but I have realized that I don't share much in this area on the blog. I'm hoping to change that, starting with today's post! A little bit of my beauty-related history for you: I have kind of been beauty crazy since I was very little. I remember being about five or six getting ready for a dance show. Mom would get a brush ready with my makeup and tell me where to apply it. I would take the brush, run to the bathroom mirror, apply the swipe, and run back for more. My grandmother would also teach me all about beauty at a very young age whenever I would have a sleepover with her and she took me to my first manicure when I was about five years old. I grew up loving makeup and learning all about it as my parents slowly let me wear it to school and also when I would apply it for dance. I ended up working in the cosmetics department at London Drugs for a couple years while going to university, and after that I worked as a product representative for a makeup line. I am no longer working directly in the cosmetic industry, but I do a bit of freelance makeup for weddings and events - it's mostly just word of mouth right now, but I'd love to do more in the future! And now on to my morning skincare routine! I have used some sort of variation of this for years and years, but these are the products I am currently using for each step. 1. Cleanser - If I'm showering in the morning, I usually use one of the scrubs that I keep in my shower, but if I'm not showering in the morning I like to use a super gentle cleanser. Since I remove my makeup before bed, I don't have to worry about having something targeted for makeup removal, but this cleanser from Garnier does a wonderful job of making my face feel fresh, even if I'm trying to get a bit of makeup off on those mornings that I wasn't that thorough in removing my makeup the night before. I have used this cleanser for years. It is so simple and I love the fresh smell. I have tried higher end cleansers and just keep coming back to this one. 2. Toner - I used ProActiv for a very short time but for some reason I was left with a huge amount of the toner. I actually enjoy this a lot, but this is my last bottle and I'm not too sure if you can get the old formula now that they have re-formulated their line. I'll probably be switching this out once it's done, because I'd like to give some more natural solutions a try. If you have any toner or toner substitute suggestions please let me know! 3. Serum - This is the step that I sometimes don't do, simply because I don't have any on hand. I do think that serum makes a huge difference, but it's also the first step for me to drop for the sake of time, space, or money. I am currently using the Intensive Renewal Serum from Arbonne and it is fantastic! I have used some of this line before, but I hadn't used more than a sample of the serum and I wish I had gotten it earlier. It helps my moisturizer go deeper, it helps regulate my skin, and it adds to a more radiant complexion. 4. Eye Cream - I tend to switch up eye creams a lot, but I've gone back to the Corrective Eye Creme from Arbonne more than once. The product goes so far, with only half a pump needed to do both eyes. I have noticed the skin around my eyes is firmer, plumper, and fine lines are reduced. 5. Moisturizer - I bought the Origins GinZing Energy-boosting Moisturizer in a set from Sephora and the moment it was gone I had to return to purchase the full size product. A little bit goes a long way with this moisturizer, and I love the smell - especially in the morning when I need a bit of a pick-me-up. The gel-like consistency allows the product to sink in quickly, and there is no oily or greasy residue on the skin. 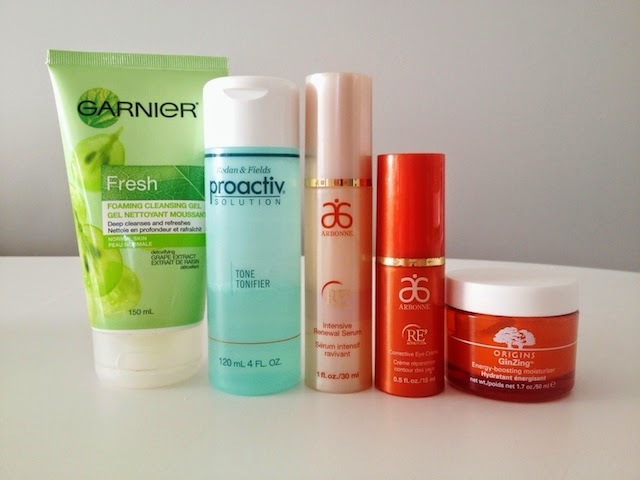 Those are my favourite morning skin care products in the order that I use and apply them. If you would like more of a review about any of the products I have mentioned, please let me know! I would also be happy to go into more depth about my skincare process and why I go through the steps that I do and the benefits each step provides, just let me know! What are your favourite skin care products for your morning routine? These all sound great! I love Origins products! I really enjoy Origins products too! I use a few others from time to time as well. Oh it is so good!! I've tried a few different serums from my days working in cosmetics and I enjoyed them, but they didn't make a huge difference for me! Maybe if I had kept at it they would have. What great products! I admit I didn't really start getting into makeup until I was well into university. Through trial and error I've found a routine that works for my skin but I'm always on the lookout for great products. I've heard amazing things about that Origins moisturizer but I think I you just convinced me to go out and get myself a jar - it sounds amazing the way you describe it! Try the moisturizer! It is fantastic! I was never into makeup until about 2 years ago, so I'm having a great time exploring this new world of girliness. I've heard great things about the Origins moisturizer, but I convinced myself that I have to finish my Neutrogena one before I get a new bottle. I'm a fan of finishing up products I already have before I purchase something new - unless I really don't like the product I'm using. I wasn't always this way though lol. How fun! I love the background on your love of make-up. I use the seaweed skincare line by The Body Shop. It's been the saving grace for my skin! I actually really like the seaweed line from The Body Shop too! I bought the travel kit a couple of times because I enjoyed it so much. I really like how the moisturizer is actually mattifying without being drying, and the toner left my skin feeling balanced and primed without stinging or drying. Actually thinking of it, I may go back to that toner once this one is out! Oh, please do! And come back here and let me know once you have :) Another one you could do is an Evening Skin Care Routine.